If the U.S. political game is beginning to pall – or even our own hockey season – there’s a new book out that brings something entirely new and exciting. Gavin Menzies has already startled historians with his books on China and its part in discovering America. He developed his interest in history from his own career in the Royal Navy where he served for twenty years, becoming a submarine captain. 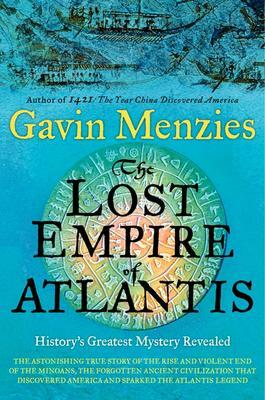 In “The Lost Empire of Atlantis” he sets out to show that it was the Minoan civilization operating some 3,000 years B.C. that sailed from its base on Crete in the Mediterranean to bring in copper and tin from spots as far away as Spain and Portugal, the south coast of India, up to Stonehenge, and the Hebrides and eventually across the Atlantic to a corner of Lake Superior which had the richest bronze in the world. Menzies has himself made trips to most of these spots and the book includes photographs of a rich collection of drawings and etchings, textiles, flat copper axes and pottery, all of which the Minoans are thought to have brought with them. Menzies checks with many other historians and archaeologists who have struggled with Plato’s myth of Atlantis. His own discoveries of treasures from the famed Bronze Age show that Atlantis might very well be the ancient Minoan civilization, which was wiped out in l450 B.C. by a massive volcano/tsunami. Menzies lives in London, England. He is widely recognized on both sides of the Atlantic as a historical detective, as well as a scholar.